Kit Madden (Claudette Colbert) is one of the most celebrated writers in America. Everyone is talking about her novel “Here is Tomorrow” and it’s in the process of being turned into a movie starring Cary Grant and Lana Turner. But just as she’s about to get on a train to California, she finds out Cary Grant isn’t able to do the movie after all. 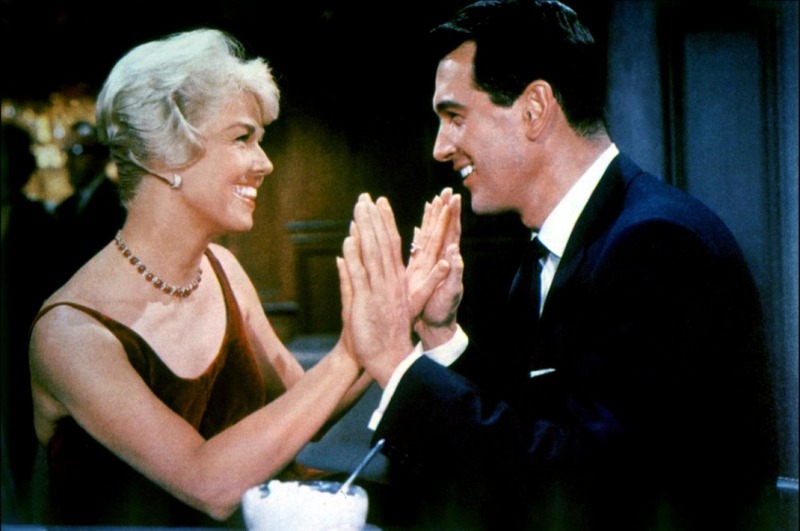 Even though the producer thinks they should try to find an unknown actor to take his place, Kit had her heart set on Cary Grant. She thinks nobody else could play that part better, until she looks up and finds herself sitting across from Rusty (John Wayne) and Dink (Don DeFore), a couple of Marines. She realizes that Rusty would be a perfect choice for the movie. She strikes up a conversation with Rusty and Dink and really hits it off with both of them. There’s just one little problem — they’ve read her book and aren’t as fond of it as everyone else is. So she tells them her name is Kit Klotch, tries to defend her book, and sends a telegram to the producer to tell him she’s found someone to take Cary Grant’s place. While at a stop in Chicago, she gets word back saying that she should stay with Rusty and Dink. But when she tries to keep up with them, she misses her train and loses her baggage. When she gets on Rusty and Dink’s train, she has to pretend she’s lost her ticket and has to ride in the coach section. But Rusty and Dink have her join them for dinner in the dining car and the three of them have a grand time. At least they have fun until Kit is accused of stealing another woman’s orchid and she gets thrown off the train. But by then, she, Rusty, and Dink have become so close that they get off the train with her. The three of them start walking and keep on walking until they meet someone with a car they’re willing to sell. Kit buys the car and they start driving to California. At one point, they stop, and Rusty comes onto Kit. Kit is caught a little bit off guard by this and Rusty is hurt by her reaction. But when the car starts overheating and the three of them have to stop at a ranch, the rancher’s daughter immediately takes a shine to Rusty. Kit can’t stand seeing Rusty with another woman, so she tells the rancher that Rusty and Dink aren’t really Marines and their uniforms were stolen so that he would make them leave. As they leave the ranch, Kit admits what she’s done, but surprisingly, Rusty and Dink aren’t mad. In fact, Rusty is happy because she’s finally admitted her feelings for him. Later when they need a hotel, Kit secretly tries to use her famous name to get them a room. But when someone notices a newspaper article that had erroneously been printed early saying that Kit was in Hollywood that day, she winds up in jail. When her movie’s producer comes to bail her out, Rusty and Dink find out who she really is and why she started following them, and Rusty wants nothing to do with her. Kit and Rusty go their separate ways, but eventually, he decides he doesn’t want to be away from her anymore. 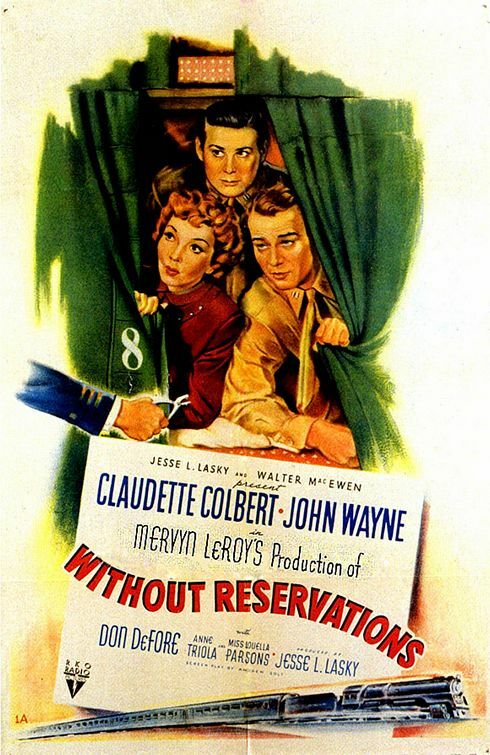 When I saw that Without Reservations involved John Wayne in a Claudette Colbert comedy, I was definitely intrigued. This seemed so different from how I typically think of John Wayne that I couldn’t resist checking it out. 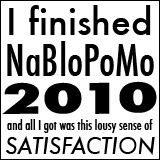 I certainly wasn’t disappointed, though. Without Reservations is such an adorable movie. Now those are words I never thought I’d find myself saying about a John Wayne movie! Claudette, John, and Don DeFore made a great trio and were simply delightful to watch. With a lesser group of key players, this movie probably wouldn’t have been as enjoyable. And it was fun watching for cameos from Jack Benny, Mervyn LeRoy, Raymond Burr, and Cary Grant. I’m always happy to see Cary Grant pop up in a movie, even if it is only for a minute! It’s a great movie, I’m definitely glad I decided to watch this one today. Posted in 1940s, Blogging Under the Stars, Comedies and tagged Cary Grant, Claudette Colbert, Don DeFore, Jack Benny, John Wayne, Mervyn LeRoy, Raymond Burr on August 13, 2011 by Angela. In 1939 Poland, a theater troupe is spending its days rehearsing a new play called Gestapo and performing Hamlet by night. 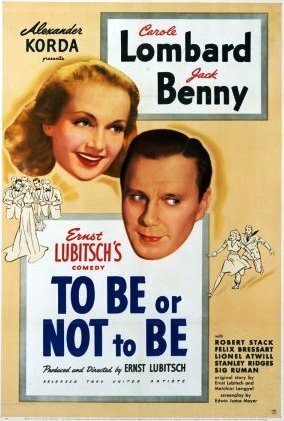 Part of the troupe is husband and wife Joseph and Maria Tura (Jack Benny and Carole Lombard). Maria has quite an admirer in Lieutenant Stanislav Sobinski (Robert Stack), who repeatedly sends her flowers before asking to meet her. Maria agrees to meet him and tells him to come see her when Joseph begins the “To be or not to be” speech. The two are attracted to each other and continue to meet up. However, just as Maria was trying to convince him that she can’t run off and live on a farm with him, they get word that Germany has invaded Poland. Sobinski has to go fight with the Air Force while the actors run for cover. While Sobinski is in England, he and some fellow pilots are cavorting with Professor Siletsky, whom they believe is on their side. When Siletsky mentions he will be going back to Poland soon, the pilots gladly hand over addresses of their loved ones so he can deliver messages for them. Sobinski asks Siletsky to give a message to Maria, but Sobinski quickly realized Siletsky wasn’t who he says he is when he says he doesn’t know who Maria Tura is. Maria was so famous in Poland that there was no way someone from Poland could possibly not know who she is. Realizing they had just given the Nazis the names and addresses of important people in the Polish resistance, Sobinski is sent to Warsaw to warn people about Siletsky. He gives Maria a message to pass on to the Polish resistance, and just as she returns from delivering the message, she is stopped by some Nazis. They bring her to Siletsky, who tries to convince her to become a Nazi spy. When she finally does get home, she finds her husband very confused about what is going on and why Sobinski is in their apartment. But ultimately, the three of them decide the best thing to do is to kill Siletsky. So Maria goes back to see Siletsky and pretends to be on their side, while Joseph gets the other actors to put on their costumes from Gestapo. One of the actors in costume goes to see Siletsky and tells him that he is wanted at Gestapo headquarters. Little does he know that Gestapo headquarters are really the theater that has been decorated with props from the play. Eventually, Siletsky realizes Joseph is an actor and pulls a gun on him. Joseph tries to escape, Siletsky chases after him, and Siletsky is shot and killed on the stage of the theater. Joseph then disguises himself as Siletsky so he can get into his hotel room and destroy the incriminating information. But at the hotel, his disguise really does fool a Nazi officer, who brings him to meet some real Nazi officials. The next day, Siletsky’s body is found and, not knowing that the Nazis know that Siletsky is dead, he poses as Siletsky again to arrange another meeting. The Nazis now know something is going on, and although Joseph manages to get out of the situation, they know it’s only a matter of time before the Nazis figure them out. So they decide to make one last bold attempt to get out of the country — on Hitler’s own plane.